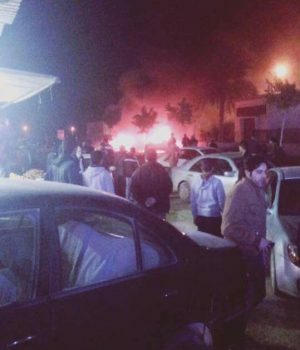 Benghazi’s Al-Salmani district has been rocked by two separate car bombs that killed at least 22 and injured 33 as worshippers were leaving a mosque after evening prayers. Ahmed Fitouri, a Libyan National Army commander in the investigation department and described as a Salafist by some, was killed. Mahdi Al-Fallah, an officer in the intelligence division is understood to have escaped, officials at Benghazi’s Al-Jalaa hospital said. The explosions happened near to the local passport office and Bayaat Al-Radwan Mosque. They were understood to have happened within 30 minutes of each other on the opposite side of the road. The second explosion targeted onlookers of the first. At this moment in time it is unclear who is responsible. The head of the information office at Al-Jalaa hospital, Fadia Al-Bargathi, said some casualties had to be transferred to Benghazi Medical Centre. Meanwhile, earlier in the day shots were fired inside Al-Jalaa hospital after an apparent disagreement between a patient and hospital worker. Al-Jalaa said that, while there were minor injuries sustained in the ensuing chaos, none were because of physical gunshot wounds. One doctor who works at the hospital said security infringements were common and she added that the incident was hardly a surprise.